"I have decided that one doesn't realise how seriously weird one's children are until one has looked at their web site." As 2012CE rolled around, the world may not have ended, but my trusty 10-year-old HP Laptop finally gave up the ghost, literally days after I'd finished the last album. Great as the laptop was, & as much work as I'd done on it, recording & otherwise, I'd started to find its soundcard's terrifyingly high noise floor increasingly problematic, & to wonder about finding a better way to record things. 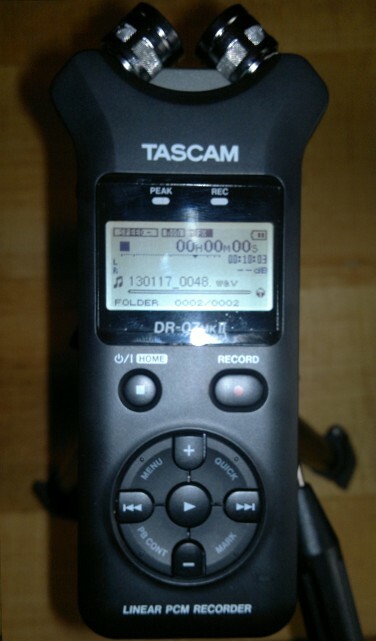 I'd become aware of these portable Digital Audio Recorders, & heard some stunning results from them. So when my Dad asked me what I'd like for Christmas, this was what I went for. & then in 2013CE, on the Ides of March, my Dad, Jim Eggleston, passed away, aged 65. Hardest month of my life (so far). So on the one hand, I'm trying to get my head around this new recording technique - which means that I'm recording a room as much as an instrument - & on the other, I've been dealing with the bereavement. The new album, when it's finished, will be dedicated to his memory, & will be entitled Memento Mori (latin for "reminder of death"). Weirdly, I'd already decided this - two days before I got the news that he was in hospital. Such are the ways of being a Discordian songwriter, sometimes. After the strict acoustic asceticism of the last several albums, the new one is likely to be a major production job, hopefully featuring - shock, horror - an actual drum kit. Maybe a piano. Maybe a cello. Maybe, if I can lay my hands on/figure out how to play one, a trumpet. Below is my short tribute to my Dad, as printed for the funeral - I wanted it to have somwhere to live on the internet. My dad was laconic; a man of few, well chosen words. In that spirit, I'll try to keep this brief. He loved golf. He loved snooker. He loved fishing. He loved cricket - lost a toenail to it (it grew back). He loved the music of Paul Simon. He loved his wife & he loved his children & he worked very hard to provide us with a secure & happy home. I don't know what year it was. We were on holiday in the Isle of Wight, which doesn't narrow it down very far, but I was probably about seven or eight. & he & I went for a walk one evening, just the two of us, ambling along the beach at low tide, peering into the rock pools. He started explaining to me that the hard, sharp limpets on the rocks actually had squishy little creatures inside with one big sticky foot that they used to clamp onto the rocks. A couple of hours later, when the sun was setting & we got back home again, he was explaining - in some detail - Einstein's Special Theory of Relativity. I'll never be able to reconstruct the conversation between those two points, but it's a very happy memory. Einstein tells us that time is just another dimension, like up/down, forwards/backwards, left/right. It might not seem that way - but the past is still happening, elsewhere. So somewhere out there, in a direction we can't point, a small boy is still walking along a beach with his dad, having a mind blowing conversation about the universe. & always will be.